Are you looking for horseback riding in Tucson? You’re in luck because the Hilton El Conquistador recently opened up their stables for horseback riding in Tucson. They invited us out for a trail ride earlier this year, here’s what we thought about riding at the Hilton El Conquistador. Pot A Gold Stables is located conveniently at the Hilton El Conquistador Resort making it an extremely convenient activity for resort guests. 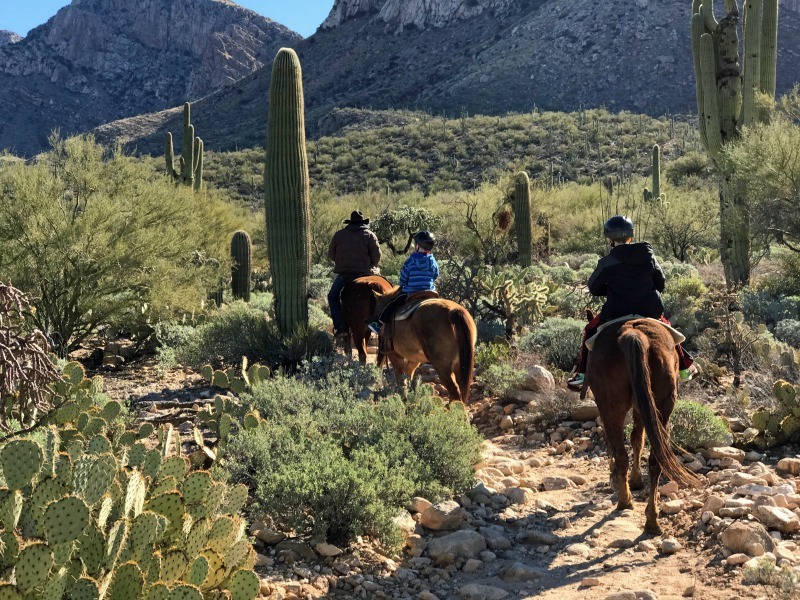 Its Northwest location is also convenient for Tucson residents wanting to take a trail ride at the base of the Catalina Mountains. We had a great experience with our trail guide, Cowboy Pancho. He ended up holding the reins for Elliot (6 1/2 years old) during the trail ride. This definitely made me feel more comfortable during our ride, I wasn’t sure how good he could control the horse if necessary. The horses are trained to follow each other, so the most we had to do work was stop them from taking breaks on the trail to eat bushes and weeds. Quinn had no problem following the instructions Pancho gave us for the ride. Trail rides up to 2 hours are available, although we found the 1-hour ride perfect for novice riders like ourselves. They also offer intermediate riding lessons and pony rides. Trail rides are available for guests ages 5 and up. The stables provide helmets, all you need to do is show up. I recommend wearing pants and closed toe shoes, as the horses do brush past some desert vegetation on the trail. The view of the Catalina Mountains and of the Tucson area are gorgeous. It’s a unique way to experience the beauty of the Sonoran Desert. You can book directly via their website or if you like to save money, check Groupon first. I’ve seen an El Conquistador Stables deal pop up a few times. In fact, my boys loved our ride so much, I’ve already bought a Groupon so we can back and ride again soon.